Forget about emojis and automated responses. The hot new feature for messaging apps this year is security -- and Facebook (FB) knows it. Facebook began rolling out a new end-to-end encryption feature on Friday called "secret conversations" with the goal of making users feel more comfortable chatting about sensitive subjects in the app. "We've heard from you that there are times when you want additional safeguards -- perhaps when discussing private information like an illness or a health issue with trusted friends and family, or sending financial information to an accountant," the company said in a release announcing the new feature. 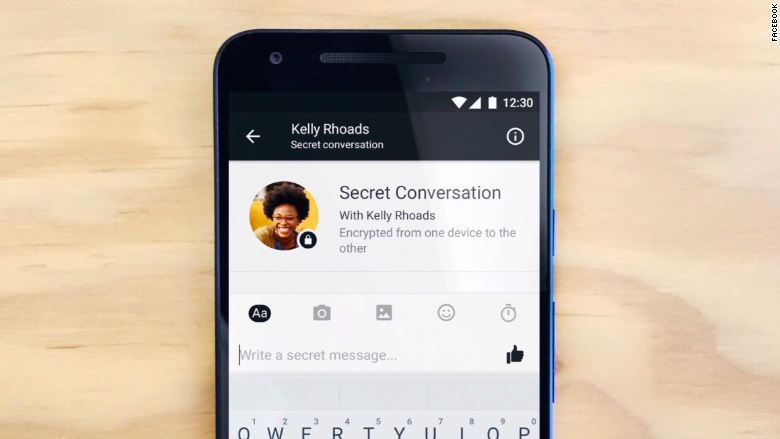 With the new feature, Facebook Messenger's 900 million users can choose to encrypt specific conversations so that the messages can only be read on one specific device. Facebook is also giving users the option to determine how long each message can be read for. The opt-in encryption feature comes months after Apple fought a very public battle with the FBI about the use of encryption. Facebook's decision to double down on encryption could pave the way for a similar dispute. End-to-end encryption, a system that prevents third parties from accessing data shared by users, has quickly become the norm for popular messaging services around the world. Viber, Line and Google (GOOGL)'s Allo have all introduced the feature recently. WhatsApp, owned by Facebook, followed suit in April. For Facebook, the encryption option comes at a time when it is working to expand Messenger from an app for keeping in touch with friends to a platform for communicating with businesses and publishers, which will likely be how Facebook makes money from the app. Security could be a key selling point for that effort.